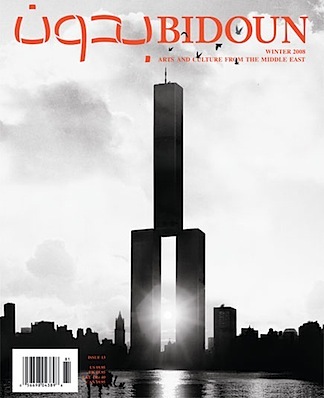 The Winter 2008 issue of Bidoun, the Middle Eastern arts and culture magazine, has been out for a few weeks now. For some weird reason I can never access it directly from Egypt, it only works through a proxy like proxyfellow.com or hidemyass.com, but it's worth the trouble to check out the striking cover (below) and some of the articles they put online, such as the essay on Moroccan counter-culture in the 1960s/1970s by Issandr El Amrani. Get the print issue (in Cairo from the Townhouse gallery, elsewhere at good magazine stores) to read about Ismail Yassin and much more.